Webcam software allows you to chat with friends and loved ones. Choosing a great webcam software can sometimes be a daunting task on account of the huge variety. If you are on the lookout for a webcam software, this article will prove to be quite handy as all of the top software mentioned here can be availed free of cost. Logitech Webcam Software, previously referred to as QuickCam Express is currently the most downloaded free webcam software. You can easily install it on your Windows PC and start chatting with friends, shoot images and record videos. Some important bugs on the previous version were fixed to give it an entirely new look and feel. Click on the Quick Capture button following which you use the toggle to pick the video or photo option. After you are ready to take an image, use your mouse to click on the camera icon. If you select the video option, you need to click the video camera icon to initiate the process of recording. To chat with your loved ones, you need to utilize the Logitech Vid HD software. You’ll have to create a Logitech account when you are first using the program. An exciting way to have interesting web-chats is by the addition of special effects to webcam chats. The free software Manycam does exactly this and offers you a whole new range of great special effects along with backgrounds to make your chats amusing. Special effects include wigs, hats, sunglasses, animals distortions etc. In addition, you can add things like flags besides your chosen time and date. The most interesting part is altering the backgrounds, which can range from a mountain or pool to a classy sepia. The effects may not look realistic-however, it’s great fun. Free video chat applications like Camfrog Video Chat from Camshare allows you to meet up and chat with friends from Zanzibar to Antarctica. The software is optimized for video chat, however, it can also handle audio and text messaging. The process of installation, registration and signing up to Camfrog may just take a minute. The compact interface has a start button which is similar to that of Firefox. It’s green in color and opens a huge list of options and features. You can quickly manage your connection and session with a drop-down menu. Users requiring more features can upgrade to Camfrog Pro. SplitCam is a free webcam application that has cool and exciting webcam effects. In addition, it’s the easiest way to break up or split webcam video stream. With this software, you can chat with your friends and simultaneously stream your videos to any video services and IMs. It supports various video resolutions, which includes HD. Some essential features of SplitCam include great webcam effects, support for all popular services, HD video support, video zooming, video recording, YouTube upload and video splitting to various programs. The new version has included languages like Portuguese, Russian, Arabic, Japanese and Spanish. bcWebCam is another simple application which uses your webcam for scanning barcodes. This is particularly useful if you have a list of items to be cataloged. An important thing to observe is that you’ll require a pretty modest webcam which can focus on various items quite closely. After installating bcWebCam, launch it and you’ll be guided to a short tutorial right away. bcWebCam can detect your webcam immediately. If you don’t see it, ensure that the drivers are installed in a proper manner. The basic interface of the software is managed by a live video window. It’s easy to use but doesn’t search renowned websites for bar codes. IP camera viewer keeps an eye on your office, home, parking lot or any place where there is an IP camera. You can view video from many cameras, all at the same time. It supports an excess of 1800 unique IP camera models, which includes Canon, Axis, Cisco, Foscam, D-Link, Mobotix, Pixord, Panasonic, Vivotek and Toshiba. All USB cameras function with IP Camera Viewer. The software permits you to configure video properties individually like the frame rate and resolution for each camera. In addition, you can set image properties like brightness, contrast and saturation for IP Cameras and USB. It allows you to digitally zoom on the image even though you may be having a camera which does not support zoom. Tango is a voice and video chat application that allows you connect with your friends with their mobile phones. It’s similar to Skype and WhatsApp and is used on your laptop or desktop to connect with users of iPhone and Android. If your family members have Tango installed on their smartphones with Wi-Fi or data plans, you can call on their phone absolutely free without having to leave your computer. The quality of audio and video with Tango is above par. It’s also simple and highly efficient. Some pitfalls of the software include variation of video quality and extremely basic options. 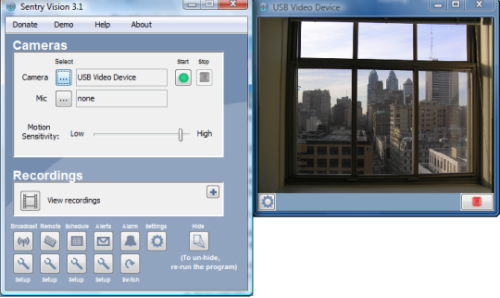 Sentry Vision is a free webcam surveillance and security program that is based on Windows. It transforms a webcam into a total home security arrangement. You can turn on the system from any location with your phone. Control/view your camera on the web on your smartphone. Some important features of this software include motion alerts, motion detection, motion audio alarm, auto startup on login, hidden mode, lockup detection, webcam broadcast, fixed timestamp, better process management etc. CyberLink YouCam permits you to add strange and interesting effects to all your webcam conversations and chats that can brighten up a dull web conference. If you want to transform yourself into an exotic and unusual creature, CyberLink YouCam is just the tool which you may be looking for. The software works with most of messaging clients like Windows Live Messenger, AOL Instant Messenger, Skype and Yahoo Messenger. The effects in CyberLink YouCam have been arranged in various tabs, with their results being applicable in real time. It has excellent background scenery effects and support for augmented reality and HD video. However, the effects can appear superimposed sometimes with the installation process consuming a lot of time. iSpy is a free webcam software that uses your microphones and webcams to identify and record sound or movement and provides surveillance, security, alerting and monitoring services. Your cameras can be controlled with PTZ, single click or automatic upload to YouTube or auto FTP to all servers. With this software, you can link and monitor any number of microphones and cameras. Import object lists and export them to share with your friends, connect many computers in a single group and supervise over the internet-all with the help of iSpy. A few languages in which iSpy is available are English, Portuguese, Brazilian, Czech, Italiano etc.